IEEE Transactions on Visualization and Computer Graphics, 23(6) : 1588-1599, 2017. Our method uses models of human perception for automatically determining design parameters of a scatterplot for given objectives. It can be used for one-shot design as well as in cases wherein input data or requirements vary. 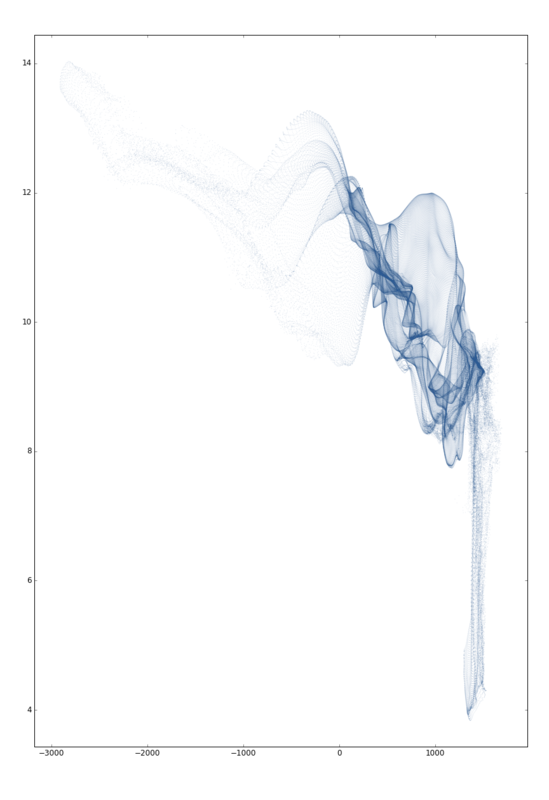 The above scatterplots show the pressure and temperature variables from the Hurricane Isabel dataset (number of dots: 5002) as plotted with (a) a standard design (in this case, the default design in Matlab) and (b) our optimized design. Click on the images to view the scatterplots in high resolution, and their design in the form of (marker size, marker opacity, image width, aspect ratio). Similar plots for the same dataset but with different resolutions are available as Supplementary Material of our publication. Designing a good scatterplot can be difficult for non-experts in visualization, because they need to decide on many parameters, such as marker size and opacity, aspect ratio, color, and rendering order. This paper contributes to research exploring the use of perceptual models and quality metrics to set such parameters automatically for enhanced visual quality of a scatterplot. A key consideration in this paper is the construction of a cost function to capture several relevant aspects of the human visual system, examining a scatterplot design for some data analysis task. We show how the cost function can be used in an optimizer to search for the optimal visual design for a user’s dataset and task objectives (e.g., “reliable linear correlation estimation is more important than class separation”). The approach is extensible to different analysis tasks. To test its performance in a realistic setting, we pre-calibrated it for correlation estimation, class separation, and outlier detection. The optimizer was able to produce designs that achieved a level of speed and success comparable to that of those using human-designed presets (e.g., in R or MATLAB). Case studies demonstrate that the approach can adapt a design to the data, to reveal patterns without user intervention. Note: All material is available for use. Please refer to the License section whenever using or adapting this material. Overview video (as the one in the Abstract section). 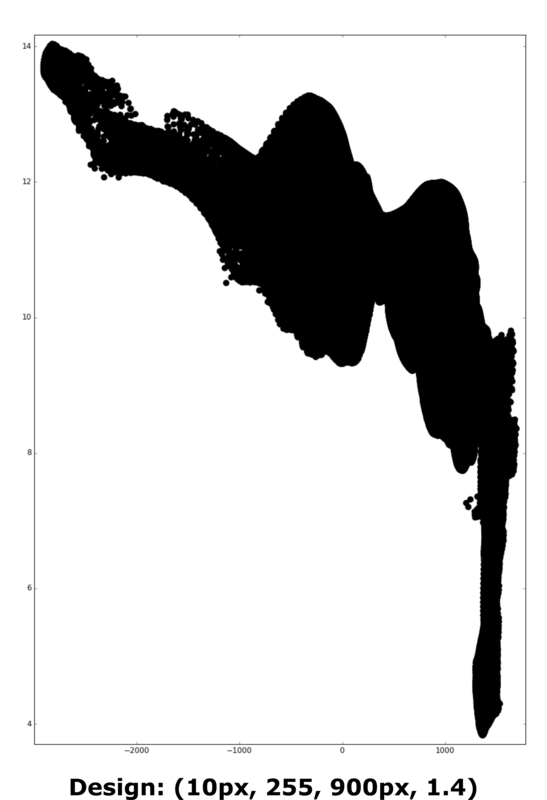 The code of our scatterplot optimizer is written in Python. All scripts are available for download. At line 25 specify the path to the data folder and at line 44 specify the list of the data set files. From line 68 to line 73 specify the design space, i.e. marker_sizes, marker_opacities, image_widths, and image_aspect_ratios. After line 415, specify the chosen weight sets as WeightsArray (see the commented code from line 440 to 443 as an example). Run main_batch.py and wait for your optimized plots! We devised an interactive tool to view the generated scatterplot designs for different weight sets calibrating our cost function. The code of the tool is written in Python. All scripts are available for download. Download the scripts to optimize scatterplots (see previous section). Run our optimizer with all the weights equal to 1. Download scripts (19KB) of the interactive tool. 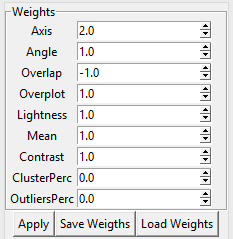 Load the desired data set and the log file relative to the optimization of its scatterplot. Enjoy! Interactively tune the weights, save them, and save the resulting scatterplot. Data points and image files of the scatterplots in Figure 5 of our publication and in the corresponding supplementary material showing the designs produced by different weight sets. Luana Micallef, Gregorio Palmas, Antti Oulasvirta, Tino Weinkauf (2017). Towards Perceptual Optimization of the Visual Design of Scatterplots. IEEE Transactions on Visualization and Computer Graphics, 23(6) : 1588-1599. Received a Best Paper Honorable Mention Award at IEEE PacificVis 2017. All the files downloaded from the Materials section are under the FreeBSD License. Refer to LICENSE.txt in the downloaded archive file for the terms. All other material on this webpage is Creative Commons Attribution-ShareAlike 3.0 Unported License. Please cite our publication and provide a link to this webpage whenever using or adapting any of the material provided on this webpage or in the publication.